Canna Flush is an additive that was designed to get rid of excess nutrients in the soil to better prepare plants for a healthy harvest. Excess nutrients can be harmful to your crop as they may cause overfeeding and over fertilization. 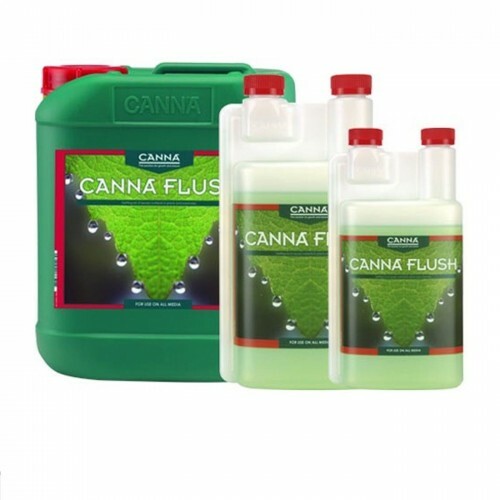 Canna Flush cleans the substrate to help your plant fight off bacteria without killing any beneficial bacteria or fungi. Canna Flush can also help revitalize and restore plans that have been over fertilized due to soil damage, excessive RO water or other such issues. It is safe to use in many various types of substrates including soil, coco and hydro substrates. It is recommended to use Canna Flush just prior to harvest to get rid of all the excess nutrients. This will lead to a more bountiful harvest with outstanding taste and texture. It not only adds flavor, but it enhances the color of your crop. Canna Flush removes any salt build-up in your substrate as well which can help your plants flourish. It retains the proper amount of nutrients in your growing environment. You should administer this product every few days to prevent over fertilization or over feeding. During the final daily feeding, mix 4ml per 1 liter of fresh water. With drain to waste systems, you should have about 10%-20% run off. Next, refill the system with fresh water and go back to your regular schedule the next morning. First water plants with tap water as usual until drainage starts, then continue with your regular watering and feeding regime. Be sure to store Canna Flush in a dark place free from frost. As with any product, keep out of the reach of children or animals.